Considering the fact that the Liberal Bee Jays play 12 of the next 15 games on the road, this was a big game. 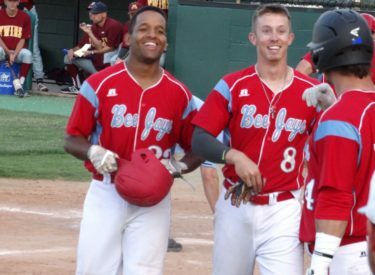 The Bee Jays wrapped up a stretch of playing their first five a home with a 6-1 win over the Derby Twins Thursday night at Brent Gould Field. The Twins scored first against starter Cody Wernli who was making his first appearance in two years due to injury. But Wernli settled down for a very nice outing going four innings with six strikeouts and no walks. Josh Sieglitz pitched three scoreless innings in his BJ debut. Zach Zeller and Cale O’Donnell both pitched scoreless innings. Derby’s starter Gabe Constatine did not allow a hit until the fourth. But O’Donnell broke through with a line drive double to left center. Brenon Rhodes added a clutch two out and two RBI single to center. The BJ’s walked four times in the inning. Garrett Scott launched Liberal’s first homer of the season into the trees beyond the wall in left for a two run shot in the fifth. The wind has blown in for all five BJ home games. Liberal is 3-2 and so is Derby in Jayhawk League play. The Bee Jays play their next six on the road beginning with a three game set at Hays Friday night at 7 on 1270 and kscbnews.net.